The earth has experienced 4.6 billion years of climate change. But what is climate? How has it changed in the past? What are the scientific facts behind global warming? Are we in the midst of the sixth greatest extinction in the history of life? These questions and more are raised in the Galt Museum & Archives new special exhibit “Earth’s Climate in the Balance” officially opening Sunday, January 22 during Museum Community Day from 1:00 to 4:30 pm. Environmental archaeologist Dr. Peter Storck, Royal Ontario Museum curator emeritus, and author, was commissioned by Bruce County Museum to create the exhibit complete with several interactive components. Using the premise “Climate through Geologic Time, 4.6 Billion Years of Change… What’s Next?” the exhibit examines many aspects surrounding this hot topic: what makes climate on earth; what tools are used in studying past climates and climate change; how has climate changed over 4 billion years of earth history; how has climate changed over recorded human history; what is the influence of life on the atmosphere and climate; what is the scientific basis of global warming over the past several decades. The stories are illustrated with over 40 artifacts and 170 time charts, photographs, satellite images and artist’s paintings obtained from universities, museums, government organizations such as NASA and the US National Oceanic and Atmospheric Administration (NOAA), as well as the United Nations body that monitors climate change: the International Panel on Climate Change (IPCC). The exhibit also examines the current extinction crisis, and interactive displays on how each one of us can affect the future of the Earth are included, such as a box store to choose environmentally-friendly products, and a recycling activity. 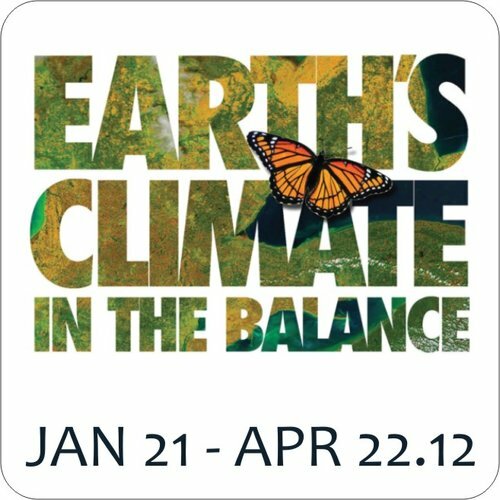 Programs reflecting the Earth’s Climate in the Balance theme will be offered throughout the run of the exhibit, including weekly family activities during Saturdays at 1:00; presentations on the first and third Wednesday monthly as part of Wednesdays at the Galt for ages 55+; The Curator Presents… on Sunday February 5; and special topics during other adult programs offered Thursdays.